Shelter is most immediately associated today with conditions of disaster, displacement and destitution. There is an inherent urgency to the word; it is first and foremost a necessity, a human right even. Yet thought of as the absolute minimum necessary to survive, shelter is an architectural stigma. Shelter is not a thing though; shelter is a verb; if there is such a thing as shelter, it is because whatever it is, shelters. 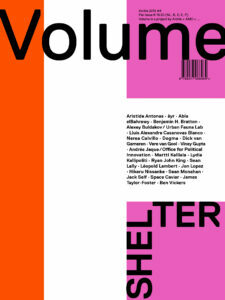 Volume #46: Shelter is dedicated to the question of how shelter can be reformulated as an architectural project.